Last weekend one of my UVic friends got married! 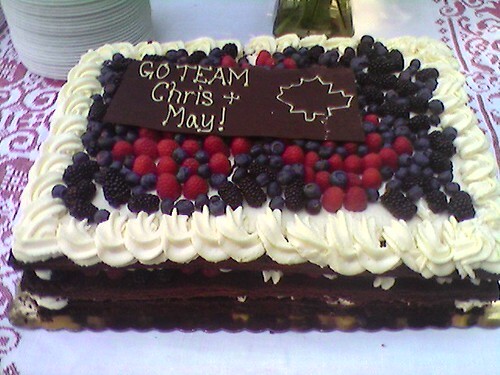 Chris and May actually got married in the morning, and invited everyone to the reception that afternoon. This being Vancouver (actually Delta), the festivities were trilingual — English, Japanese, and some Chinese — and the spread of food was even more eclectic. Many congratulations and happiness to you both! I went to a party later that night. We were on a boat singing [On A Boat](http://www.youtube.com/watch?v=R7yfISlGLNU). Worryingly, there may be footage on the Internet somewhere. On Sunday I played old school AD&D 2e. Somehow this transpired. Who would be crazy enough to let me near his child? This Tuesday I met with an ex-coworker and, after nearly a year, finally returned her tent. And last night was, yes, the New Pornographers concert! I went there with Gavin, and it was awesome. It was my first time seeing the full line-up, including Neko Case and Dan Bejar. There wasn’t a dead moment in the entire set. Also, The Dodos were one of the opening bands. First time I’d ever seen a three-person band with two percussionists, or a xylophone on stage. Awesome. Marc: So you think Vancouver is multilingual, do you?